Dr. David J. Pate Jr. is an expert on low income African-American men, fatherhood, and child support. Dr. Pate studies how black men are affected by the social welfare system and the challenges that impede their ability to attain economic security. 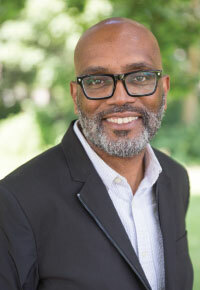 His research projects involve the use of qualitative research methods to examine life course events of African-American men and boys. Appointed Member, UWM Office of Conflict Resolution, Ombuds Council. Ombuds Council members assist with helping UWM employees consider a variety of options to help resolve conflicts. Participated on the social science research and writing team which submitted two amicus briefs for the Center for Family Policy and Practice (CFFPP) in support of the petitioner in the Turner v. Rogers case to the United States Supreme Court. Oral arguments were presented on the case in Washington, D.C. on March 23, 2011. The decision was rendered on June 20, 2011. Elected member of the National Academy of Social Insurance. The Milwaukee Reentry Alliance Project. Awarded from the Tommy Thompson Center on Public Leadership, University of Wisconsin-Madison. Principal Investigator: David J. Pate, Jr. Funding Period: January-June, 2019. Amount: $56,675. The Milwaukee Reentry Alliance: Improving the health outcomes of communities impacted by incarceration. Awarded from the Wisconsin Partnership Program, Community Impact Grant, University of Wisconsin-Madison, School of Medicine and Public Health to Employ Milwaukee. Principal Investigator: David Pate. Funding Period: 2019-2023 Amount: $1 million. Engaging African American Fathers to Improve Health Literacy. Awarded from the Greater Milwaukee Foundation ($40,000) and the United Way of Milwaukee ($2,500). Co Investigators: David Pate, University of Wisconsin-Milwaukee, Helen Bader School of Social Welfare and Kris Barnekow, University of Wisconsin-Milwaukee, College of Health Sciences. Funding period: 2018. Improving Health Through Enhanced Work. Awarded from the Wisconsin Partnership Program, Community Impact Grant, University of Wisconsin-Madison, School of Medicine and Public Health to Community Advocates. Total project award: $1 million. Principal Investigator: James Topitzes. Co-Investigators: Joshua Mersky and David Pate. Funding period: 2017-2022. Evaluation of Resiliency in Communities After Stress and Trauma (ReCAST). Awarded from the federal office of Substance Abuse and Mental Health Services Administration (SAMHSA), to the City of Milwaukee, Office of Violence Prevention and Community Advocates. Total project award: $5 million. Principal Investigator. Funding period: 2016-2021. Pizur-Barnekow, Kris, David J. Pate Jr., Katie Lazar, Nelly Paul, Kathleen Pritchard, and George Morris. (2017). “African American Fathers’ Occupational Participation: “Keeping Mothers in a Positive Vibe.” OTJR: Occupation, Participation and Health. 37(4):237-244. First published online on July 14, 2017. Topitzes, James, David J. Pate Jr., Nathan Berman, and Christopher Medina-Kirchner. (2016). “Adverse childhood experiences, health, employment: A study of men seeking job services.” Child Abuse and Neglect first published online September 29, 2016. Brito, Tonya, David Pate, and Jai-Hui Stefanie Wong. (2015) “I Do for My Kids”: Negotiating Race and Racial Inequality in Child Support Enforcement Proceedings”. Fordham Law Review, Fordham University, School of Law.